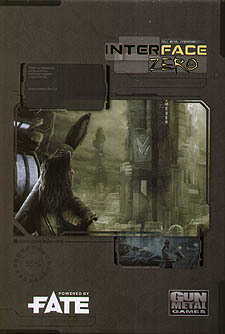 Interface Zero 2.0: Fate Edition has all the rules you need for cyberpunk action and adventure in the megacities and wastelands of the 2090's. Inside this 352 page book you'll find hackers, drone pilots, cyborgs, androids, cybermonks, human/animal hybrids, psychics, cybernetic implants, guns, armour, vehicles, agile powered armour and massive war robots. Pre-build aspects, occupations, and archetypes jump-start your game, and a flexible wealth system lets you get rich or die trying. Whether you're a sprawl-crawling-scavenger or an elite soldier, your tools and tech are all here in Interface Zero.